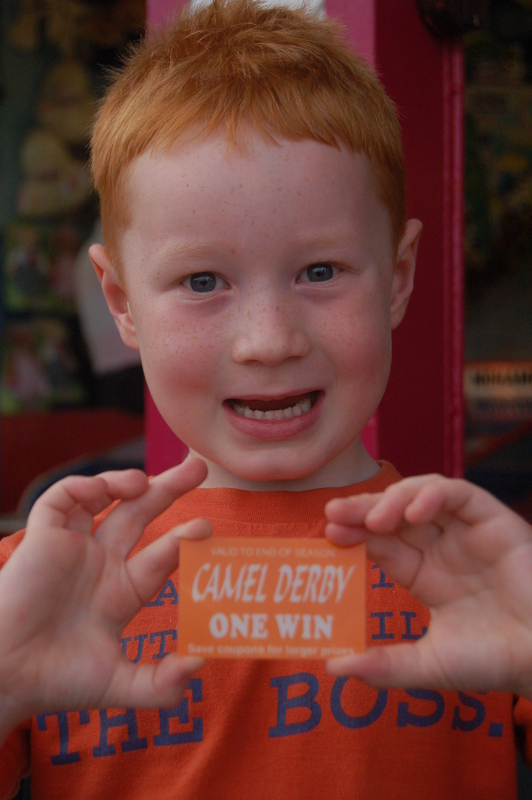 One joy of our holiday in Great Yarmouth has been the children’s discovery of the camel derby attraction on the Britannia Pier. 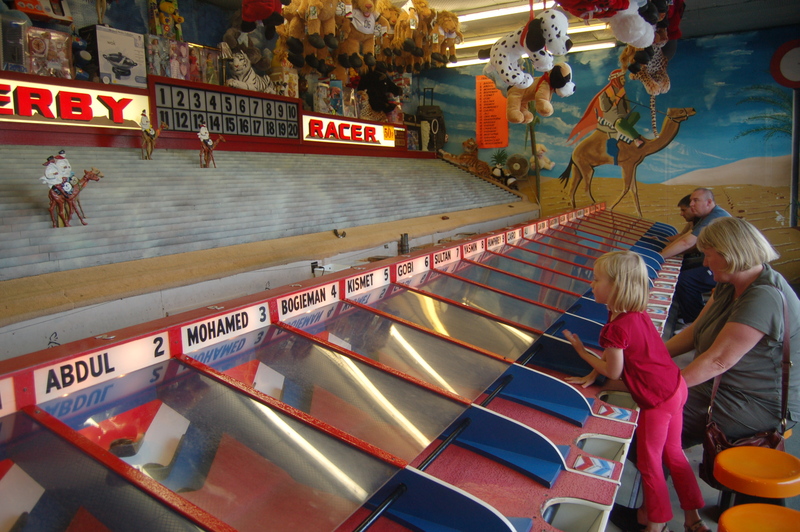 Not a real one, as held in Kenya and other places, but a mechanical-electrical game where contestants thrown balls into holes to propel their camels along the track. Rebekah takes great delight in it, win or lose. It’s all good fun. She competes to the best of her ability, and accepts the verdict, wherever she comes in the race. She has even been known to give her winning token away to her little brother. Although the first time she won, she was delighted to use that token in order to gain the prize of a jigsaw that had to be made up and coloured in. Mark is totally different. If he wins, he is ecstatic. So when he beat about fifteen others one evening, he nearly went into orbit. But if he loses, he isn’t just disappointed. He goes into the hugest strops imaginable. Old cliches about redheads and tempers come into play. He is inconsolable. Winning is everything to him. For Rebekah, playing the game is the be all and end all. So who is right? The Brit in me sides with Rebekah. Play the game and enjoy it, but don’t be crushed by defeat. However, that can be just a coping mechanism to stave off the pain of losing. I guess (going by stereotypes) that if I were American or Australian, I might be more likely to side with Mark. The competitive spirit means the world. And maybe we’re too British like this in the church. We can play the game and not worry about how we are doing. We rationalise away failure with slogans about faithfulness. (Not that faithfulness itself should be denigrated.) We dislike certain emphases on ‘success’ that rely heavily on manipulation, and I have preached and written against such things before. But sometimes we do so in such a way that we forget the New Testament injunction to ‘run in such a way as to win the prize’. Granted, it’s a different kind of prize, but sometimes the passion isn’t there, and we aren’t devastated when things haven’t gone as they should have done, according to the Gospel. Could we do with a bit more passion and devastation in the church?